In the last tutorial we added Windows. Now it is time to learn about Action Zones. What is an Action Zone? 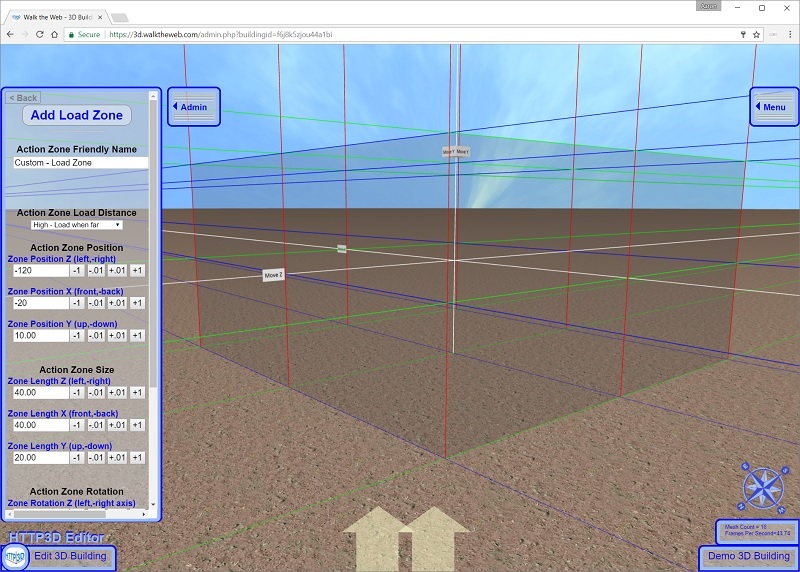 In 3D Browsing, an Action Zone is a 3D space that triggers an action when an Avatar enters it. Picture a Transparent 3D Box. (Tinted so you can see it when you edit it). When you move your Avatar into the 3D Box, it triggers SOMETHING to happen. So what is the SOMETHING? Sliding Door – Make 3D Objects move in a straight line, any direction, and return. Swinging Door – Make 3D Objects move in an arc around a point and return. Ride Along – Make your Avatar (and Current View) move with a moving 3D Object. Rotate – Make 3D Objects rotate around a point. Notice that a Load Zone, Ride Along, and Rotate all occur to the primary user (Avatar) and a Swinging or Sliding Door can also be triggered by other Avatars when Multi User is on. Basically, another Avatar can open and walk through a door as you watch. After you learn about each of the Action Zones, it is time to Create a New 3D Thing.